Paleo Caramel Apple Oatmeal is what is for breakfast this week. 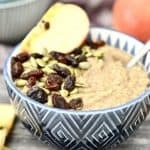 This grain free oatmeal is also safe for the Whole30 diet and tastes amazing! It’s like eating dessert for breakfast. A healthy, gluten free breakfast. Happy Monday! Today we are enjoying this new Paleo Caramel Apple Oatmeal recipe. It’s basically like eating dessert for breakfast. Because there’s nothing wrong with that if you ask me. Nothing at all. Especially when it’s healthy dessert. I have been getting a few requests lately for paleo breakfast ideas that don’t contain eggs. So I decided another paleo oatmeal recipe was in order. And this might just be the best paleo oatmeal I have ever created. It’s actually been a long time since I made a new paleo oatmeal recipe (over a year actually), but if you are new here I have a few others including Paleo Raspberry Coconut Oatmeal, Creamy Paleo Oatmeal, and Paleo Chocolate Raspberry Oatmeal. So if you are stuck in a paleo breakfast rut you may want to try some of those for a bit of a change. A very delicious change. I know I have been a little absent lately around here. I am sorry friends! But I am back I promise. Things were just a little hectic in my real life lately. Sometimes juggling three jobs can be a little challenging. For some reason a lot of my patients have been really sick lately so I have had to spend some extra time in the office and I also had to give my annual rheumatology rounds presentation last week so that was taking up a lot of my time. But it’s over now for another year which is a nice relief. My Beautycounter business has also really picked up lately so I have been spending more and more time on that as well. It’s nice to see all my hard work starting to pay off! I have had a bunch of amazing women join my team recently and helping them start their businesses has been so fun and rewarding. I am busy working on my three year retirement plan and I am starting to think that it can actually be a reality. The financial freedom that Beautycounter has started to give to me is pretty incredible. I never would have thought when I first joined but I am pretty confident that within the next two years my Beautycounter income will surpass my physician income. How crazy is that? It hasn’t been all work and no play around here though. Don’t worry I am still making time for the things I love like spin class, watching This Is Us (how amazing is that show by the way? ), cooking, reading and working out. On Friday I also did a locked room with my girl friends for the first time. Have any of you done one before? It was super fun! And we managed to get out of the room which of course felt good. Apparently only 5% of groups get out of the room we did so that made us feel clever. I totally want to do another one now! We also went to a restaurant I had never been to called Brasserie which was pretty darn delicious. I only wish that I could have gotten one of their desserts because they looked amazing! And they even had grassfed steak, which of course I had to have. And on Friday I leave for San Diego for a week! I haven’t been there in almost 10 years so I am super excited. I am going for the American College of Rheumatology annual meeting to do a little brushing up on my rheumatology knowledge. Because well, since I wrote my exams last year my motivation to read anything rheumatology related has not been that high. My brain was just totally fried after all those years of training and studying. So it’s time I do some more learning, and hopefully a lot of exploring and eating while I am there as well. If you have any restaurant suggests for me while I am there please let me know. I rented an apartment like usual so that I will have my own kitchen. That is one of my tips for surviving on the paleo diet when you travel. I actually wrote an entire post about this called How To Travel On The Paleo Diet if you are interested. Because you shouldn’t have to miss out on traveling just because you are eating paleo. Not on my watch anyways! Now I know the real reason you are here is for this Paleo Caramel Apple Oatmeal recipe right? So let’s chat about it. Not only is this recipe paleo, meaning it is grain free and dairy free but it is also Whole30 compliant. Yep Whole30 oatmeal! It really is possible. It is also vegan, GAPS and SCD safe. In other words it is safe for almost every special diet out there. Because eating a restricted diet should NOT be boring. This Paleo Caramel Apple oatmeal really does taste like you are eating dessert for breakfast. I had to stop myself from eating the entire batch in one sitting. It has become a new staple in our house because it also makes a great snack and is super simple to make. It comes together in just minutes. If you are looking for even more paleo, vegan and Whole30 recipes make sure you are signed up to my newsletter. There are many recipes, deals and giveaways that I share ONLY with my subscribers. Because I appreciate you guys so much! You can sign up below by simply leaving your email. And no spam ever, promise!